The Days of Johann, an agility dog! 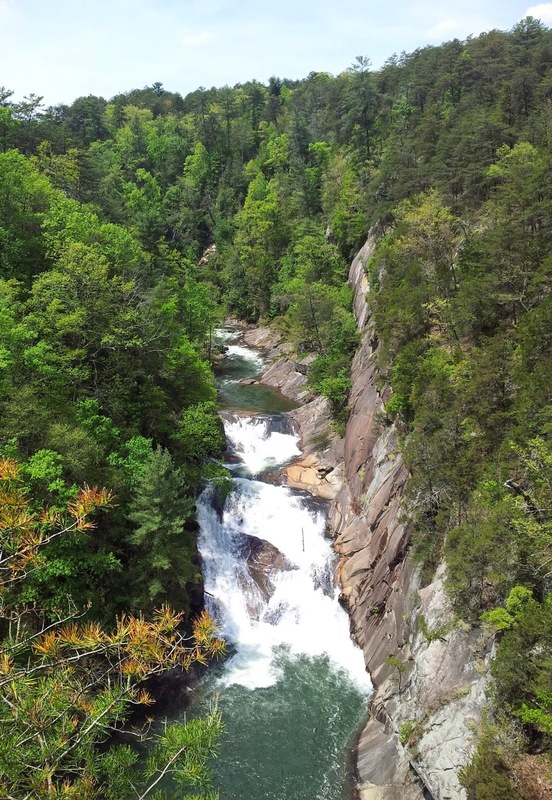 : Hiking Tallulah Gorge! 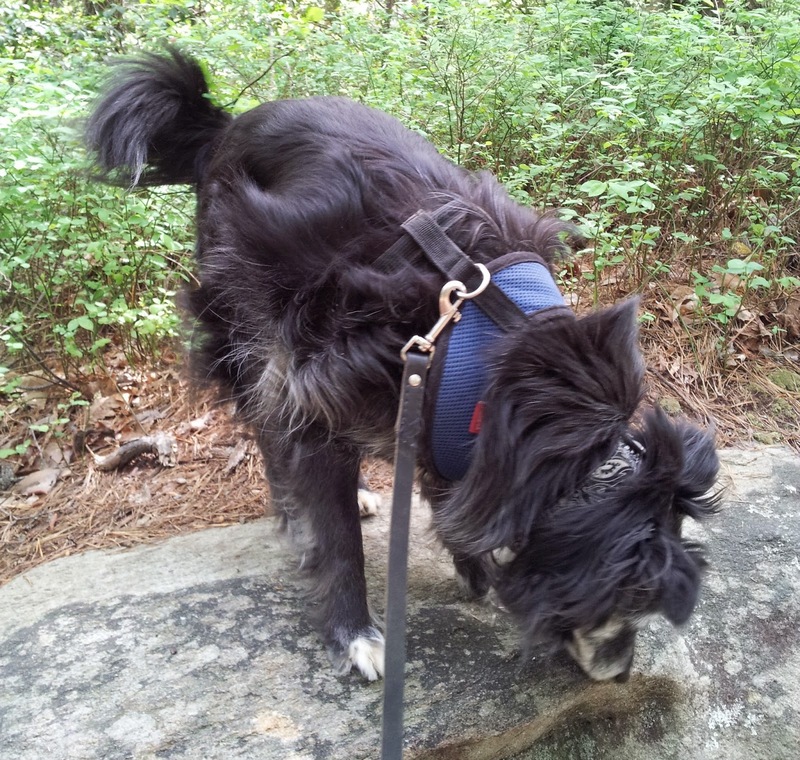 Back in April, we went on a day long hiking trip with our pal Rocco Havanese and his Mum from To Dog With Love. We got to see two beautiful sites, get in some exercise, some socialization and time away from work and the cabin. We started out early in the AM and met up with Rocco and his Mum in Dahlonega. We piled into one car and started the drive to our first stop Tallulah Gorge State Park. Our goal was to hike a little and see some of the amazing falls in the area. 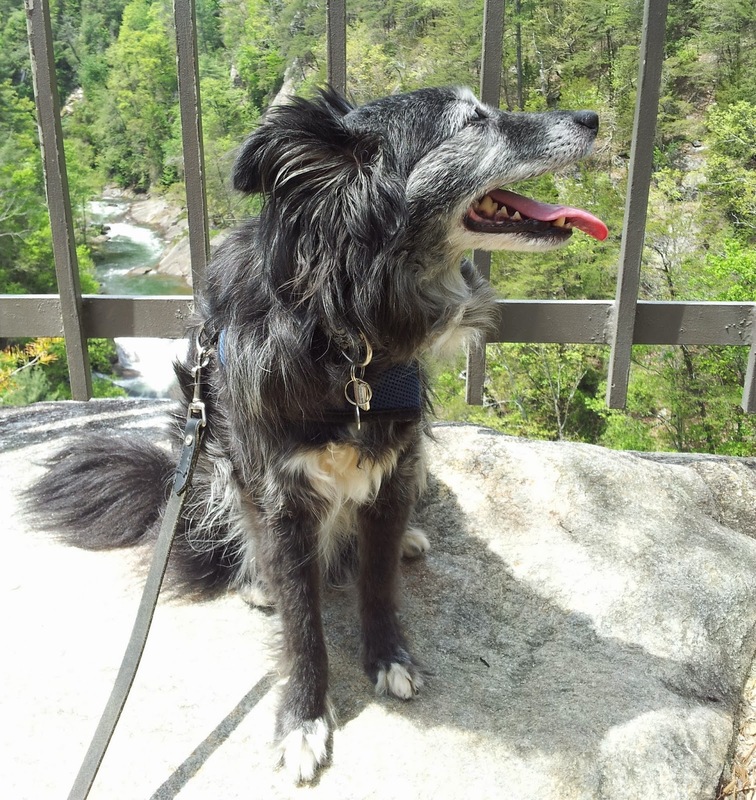 We have hikes around our cabin, and other trails around here, where we see green, green and more green; so we enjoy these days where we can take some destination hikes! 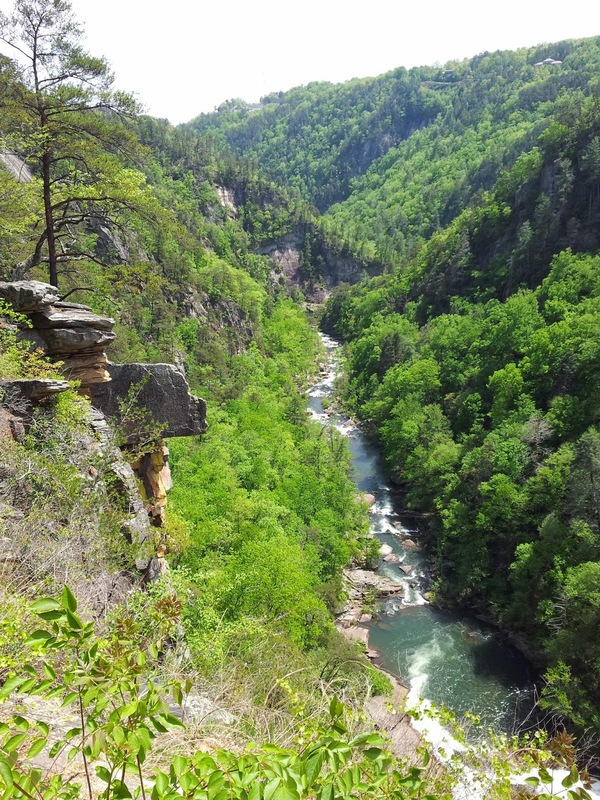 The Tallulah Gorge is a 2 mile long gorge that is formed by the Tallulah River cutting through the Tallulah Dome rock formation. It features lots of rocky cliffs up to 1,000 feet high, and several falls collectively known as Tallulah Falls and individually called l'Eau d'Or, Tempesta, Hurricane (the tallest at 96 feet), Oceana, the smooth "sliding rock" at Bridal Veil and Lovers Leap. 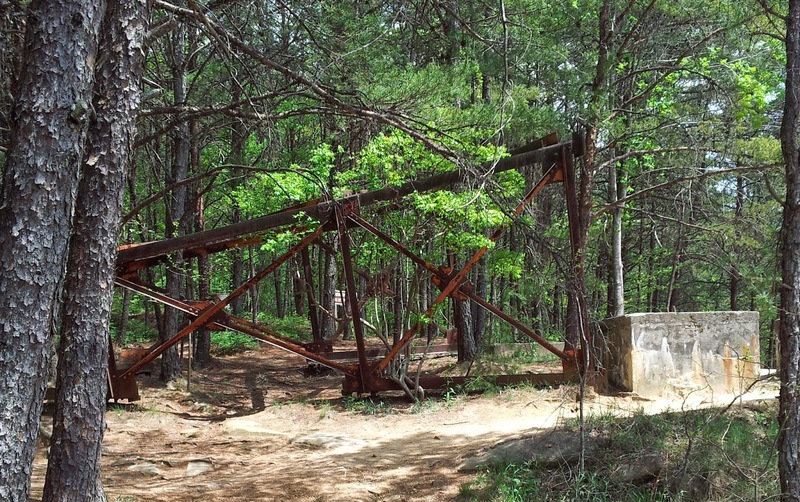 All of these are connected through trails, swinging bridges, a little drive around the gorge and more trails. We stayed on the North Rim. 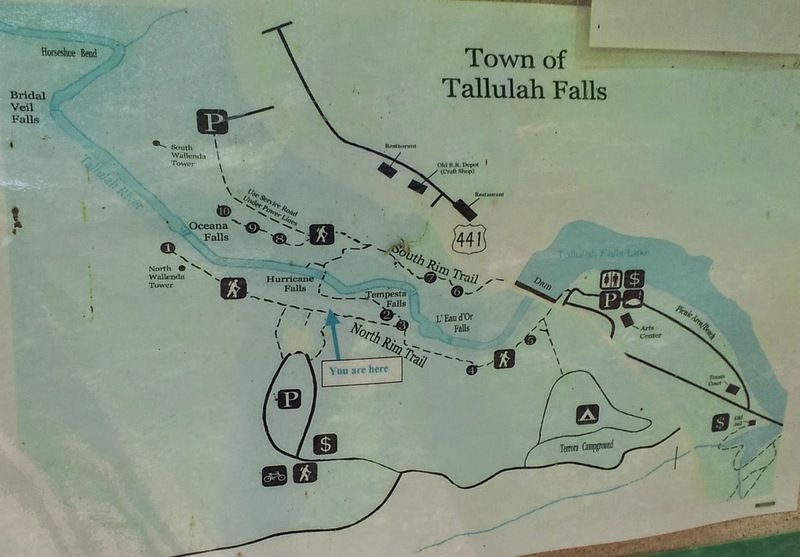 We started at the Visitors Center (dogs are not allowed) and had to sneak behind the building to get to the trail that leads to the falls. 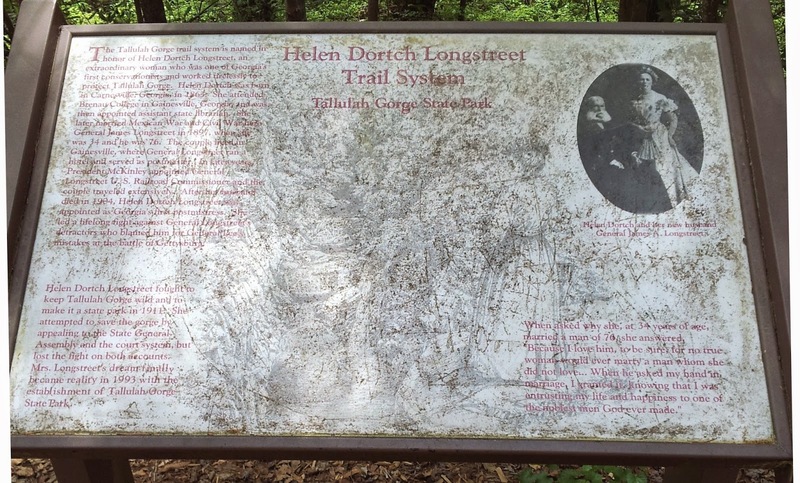 As we walked we noticed this sign that indicates that the trail system here is named after Helen Dortch Longstreet, an early environmentalist. (Click to enlarge and read more). 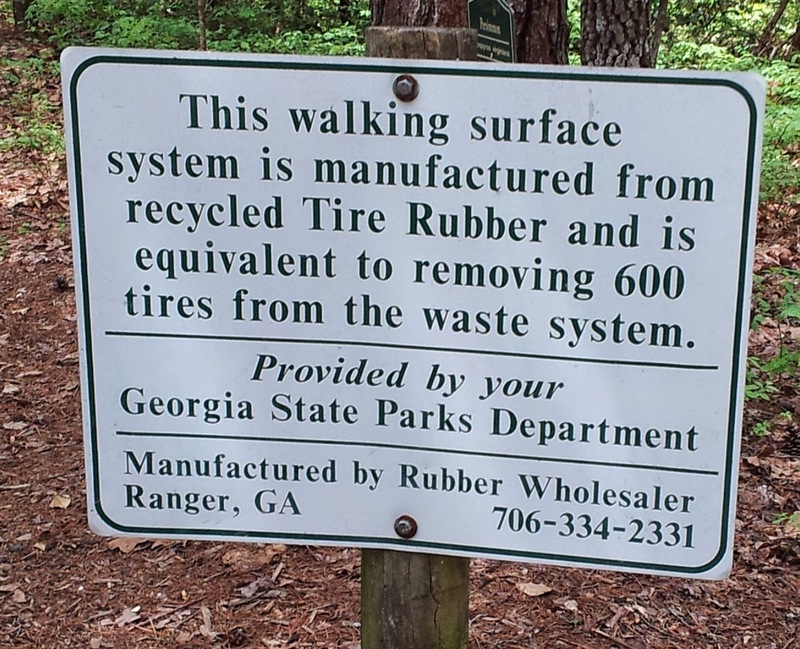 She would be proud that the path we were on saved hundreds of tires from ending up in landfills. We explored...and hiked a few small trails, but were anxious to see the grand falls everyone was talking about! After a little hiking we finally made it to an outcrop where we had a nice view of the falls. These are the first falls we saw - Tempesta Falls! Gorgeous Gorge! The obligatory photo of me in front of the falls, BOL! 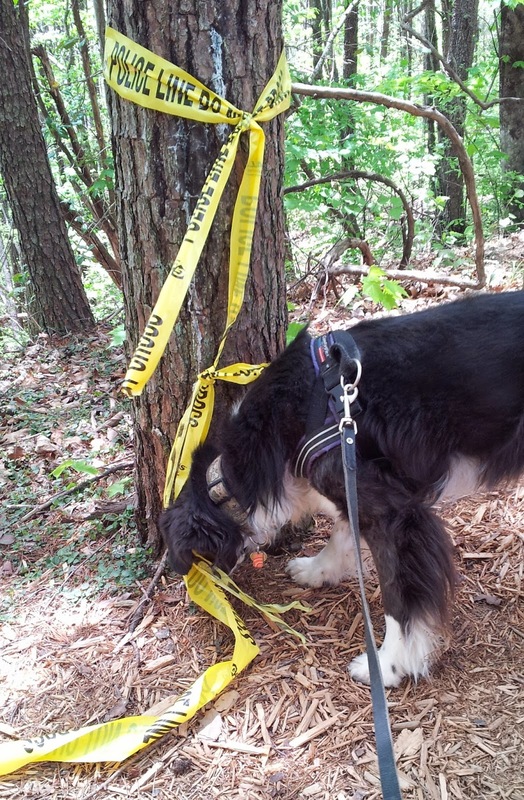 We headed down another trail and came across some crime scene tape! OMD! What is that all about. 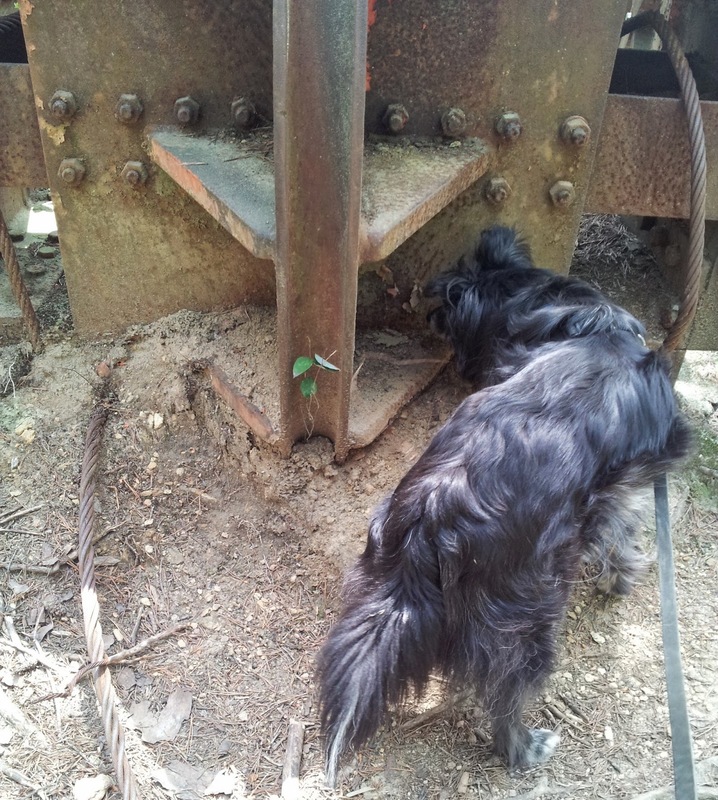 (That's Gracie, crime scene dog extraordinaire on the case!) Seems that this is where you can get a permit and then do some heavy duty rock climbing with all the appropriate gear, and this tape may have been there to keep us out since we didn't have one of those doggone permits. 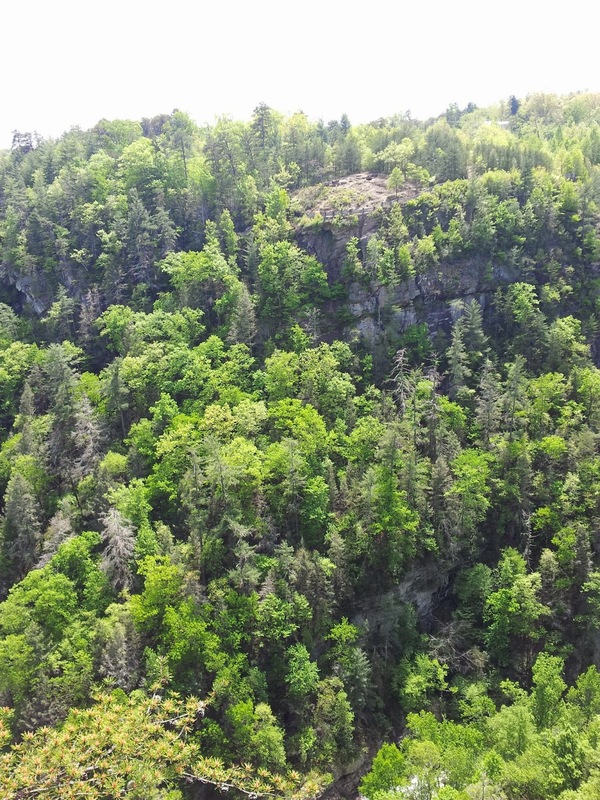 We walked down further and saw this view of the Gorge from the other way, wow, just wow! And very, very interesting....at this site is where the World's famous Karl Wallenda walked across the Gorge way back in July of 1970 with over 30,000 people watching. During the walk he even did two handstands at 65 years old! There he is back in the day making his walk across. You can even still see the big apparatus he used to hold his big wire tightrope. It's toppled over now, but you can see one of the pylons and the steel structure to the left overturned. In this photo you can see the other side from where he walked. That's a fur piece! Here is the top of the pylon, see that scooped thing in the middle (up and down)? That's where the big tightrope wire was stabilized at the top of the structure. And you can also see the big tightrope wire. So cool! 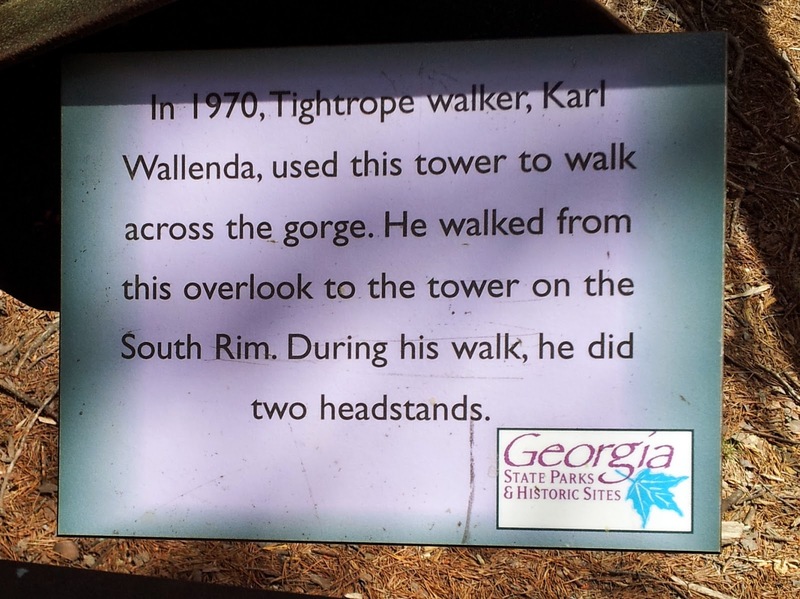 We found out that Nik Wallenda, the grandson of Karl) is planning to take the very same walk across Tallulah Gorge next month on July 18, 2014, 45 years after his grandfather took the famous walk. We finally headed back to the car after exploring and drove to our next hiking area where we were headed deep into the Chattahoochee Forest to see the Minnehaha Falls. Stay tuned! Wow! What a fabulous spot for a hike! We're glad that you sneaked in, Johann. So very beautiful! That would be a great place to take a hike!